The Tampa Bay Rays visit Globe Life Park on Friday to play the Texas Rangers. The probable starters are Matt Andriese for the Rays and Yu Darvish for the Rangers. The opening line for this matchup has Tampa Bay at +194 and Texas at -210. The over/under was set at 9. The Rays have a 77-73-8 over/under record and a 73-85-0 run line mark, meaning they cover 46% of the time. The Rangers are 82-77-0 against the run line and have a 79-71-9 over/under record. They cover the spread 52% of the time. The Rays head into this matchup with a 65-93 record, including 29-48 on the road. Starting pitcher Matt Andriese has a 8-7 record with an earned run average of 4.34 and a WHIP of 1.21. He has 103 strikeouts over his 122.1 innings pitched and he has given up 124 hits so far this season. He has allowed 9.1 hits per 9 innings and he has a FIP of 3.67. The bullpen this year has an earned run average of 4.17 and they have given up 481 base hits on the year. Teams are hitting .252 against the bullpen while being struck out 451 times and walking 194 times this season. As a team, Tampa Bay has allowed 8.82 hits per nine innings while striking out 8.51 batters per nine. They are 18th in the league in team earned run average at 4.23. The Rays pitchers have collectively given up 1,363 base hits and 654 earned runs. They have allowed 205 home runs this season and they allow 1.3 homers per nine innings as a staff. Tampa Bay as a pitching staff has walked 481 batters and struck out 1,315. They walk 3.1 men per 9 innings while striking out 8.5 per 9. They have a team WHIP of 1.33 and their FIP as a unit is 4.27. As a team, Tampa Bay is batting .244, good for 28th in the league while putting together a .253 average away from home. The Rays hold a .427 team slugging percentage and an on-base percentage of .308 which is good for 27th in baseball. They rank 27th in baseball with 8.23 hits per game. Evan Longoria comes into this game hitting .273 and his on-base percentage is at .319. He has 168 hits this season along with 80 runs scored and 95 runs batted in. He's struck out 141 times and has walked 42 times. Logan Forsythe is hitting .268 and he has an on-base percentage of .338. He has totaled 133 hits so far while scoring 76 runs and he's driven in 52. He has walked 46 times and has struck out 123 times. The Rays have 1,300 hits, including 275 doubles and 214 home runs. They've stolen 58 bases while they've been thrown out stealing 36 times. Tampa Bay has walked 439 times this season and they've struck out 1,446 times as a unit. They've left 1,030 men on base and have a team OPS of .735. They score 4.15 runs per contest and have scored a total of 656 runs so far this year. Texas comes into this matchup with a 52-26 home record and a 94-65 overall mark. With an earned run average of 3.53, Yu Darvish has a 6-5 record and a 1.15 WHIP. He has 120 strikeouts over the 94.1 innings he's pitched during which he has given up 78 hits. He has allowed 7.4 hits per nine innings and his FIP stands at 3.3. So far this season the bullpen has an earned run average of 4.46 and they have given up 514 base hits on the year. Teams are hitting .260 against the Rangers bullpen while being struck out 417 times and walking 187 times this season. As a team, Texas has allowed 9.03 hits per nine innings while striking out 7.18 batters per nine. They are 23rd in the league in team earned run average at 4.41. The Rangers pitchers as a team have surrendered 1,419 base knocks and 694 earned runs so far this season. They have given up 200 home runs this year and they give up 1.3 home runs per nine innings as a staff. Texas as a staff has walked 528 hitters and struck out 1,129. They give up a walk 3.4 times per 9 innings while they strike out 7.2 per 9. Their team WHIP is 1.38 while their FIP as a staff is 4.61. As a team, they are batting .262, good for 5th in the league while putting together a .281 average at home. The Rangers hold a .434 team slugging percentage and an on-base percentage of .322 which is good for 14th in baseball. They rank 7th in baseball with 8.94 hits per contest. Ian Desmond comes into this matchup batting .284 and he has an OBP of .334. He has 176 hits this year along with 106 runs scored and 86 RBI. He's struck out 159 times and has walked on 43 occasions. 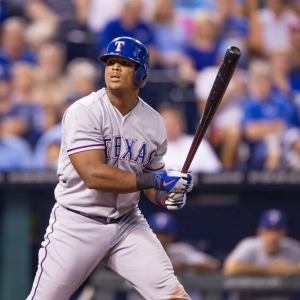 Adrian Beltre is hitting .298 and he has an OBP of .356. He has collected 172 hits so far while he's scored 88 runs and drove in 103. He has earned a walk 48 times and has punched out 66 times. The Rangers as a unit have 1,422 base hits, including 254 doubles and 211 homers. They have 95 stolen bases while they've been thrown out 36 times. Texas as a team has walked 428 times this year and they have struck out 1,185 times. They've had 1,014 men left on base and have an OPS of .757. They score 4.76 runs per game and have totaled 757 runs so far this season.